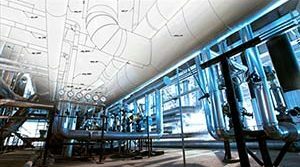 Polyurethane Products for Piping System | Piping Technology & Products, Inc. The two pictures above show two types of polyurethane products produced by Piping Technology & Products, Inc. for piping systems. At the top are cold shoes to support piping at cryogenic temperatures. The polyurethane cradle is bonded to steel shield which is welded to a T-bar. 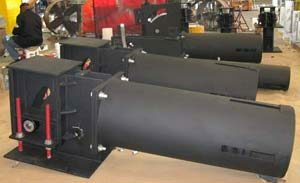 These cradles are produced by pumping the chemical components required into a mold which gives them the correct shape. 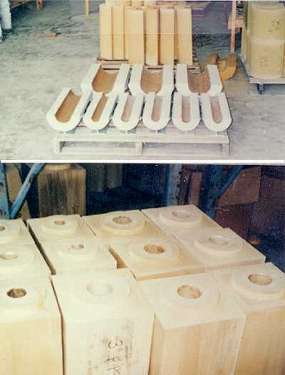 At the bottom are supports produced by drilling and machining solid polyurethane blocks. Polyurethane provides both insulation and the strength to support pipes at cold temperatures. Need any polyurethane products? We can price them for you today!